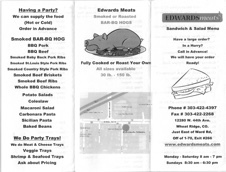 Edwards Meats Lunch Menu will satisfy any appetite. 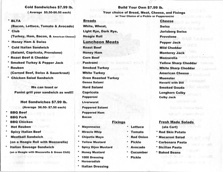 We have a large selection of cold and hot sandwiches and "build your own". Fresh Breads, deli salads, chips, and drinks. Call in your order at 303-422-4397, and we will have your order ready for pick up. Sandwiches and build your own are $7.99 per pound and are served with a 1/4 pickle or pepperoncini. Click to download full lunch menu.